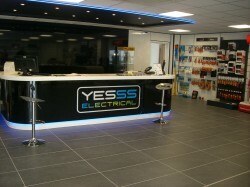 Principal contractor Hampshire Mezzanine Floors have worked with dynamic new electrical wholesale company Yesss Electrical to fit out seven of their branches across the UK and the Channel Islands. 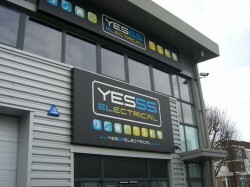 Experienced electrical wholesale company Yesss Electrical have over 50 years experience in the industry and have got over 400 branches across Europe, enabling them to deliver the highest possible service. Southampton based HMF have been industry leaders in mezzanine floor installations throughout the UK for over 26 years. HMF have already completed four of the new branches for Yesss Electrical including Guernsey in the Channel Islands, Yeovil, Weymouth and Hounslow. The projects involved the complete fit out of the branches including storage platforms on some sites for storage of the electrical stock, trade counter area, offices and welfare facilities. HMF are a main contractor that carry out the complete fit out of your premises. HMF mainly work in industrial and commercial premises including warehouses, factories, retail and offices. HMF provide a complete design service of your site including the installation of mezzanine floor, partitioning and ceilings as well as shelving and racking, building works and mechanical and electrical installations. HMF provide designs using latest AutoCAD technology and have their own directly employed fitters who are well trained to offer excellent customer communications and deliver a quality fit out package.